Fresno State’s renowned campus-grown sweet corn will be available for the first time this year at 7 a.m. Friday, June 8, at the Rue and Gwen Gibson Farm Market (5368 N. Chestnut Ave.). 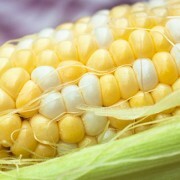 Customers can choose from the traditional yellow and white varieties of the market’s most popular product. Corn will be sold at 50 cents per ear throughout the summer while supplies last. To save time and avoid the crowd, customers can also purchase a pre-bagged dozen ears of yellow or white corn for $8 on Friday and Saturday. The store will have special weekend hours from 7 a.m. to 7 p.m. on Friday and Saturday and 8 a.m. to 5 p.m. on Sunday. Last year more than 200 shoppers lined up outside the Gibson Farm Market on the first morning of sweet corn sales. If that occurs again this year, groups will be let in periodically to remain within the building’s capacity of 40 customers at a time. Extra parking is available in the dirt lot north of the market. More than 800,000 ears were sold in 2017. Shoppers purchased a record 38,586 ears on opening day last year and a record 78,473 ears during the opening three-day weekend. The product was first grown on campus fields in 1981 and was first sold to the public in 1982. Sweet corn is raised on the 1,000-acre University Agricultural Laboratory that includes 22 enterprises that provide student-made dairy, food processing, fruit, horticulture, livestock, meat, nut and wine products to the Gibson Farm Market. About $1 million in products are sold each year at the market to support Jordan College of Agricultural Sciences and Technology students and programs. The store will resume its normal summer hours on Monday, June 11, which are 8 a.m. to 7 p.m. on Monday through Friday; 9 a.m. to 6 p.m. on Saturday; and 10 a.m. to 4 p.m. on Sunday. Shoppers can enjoy several special, student-produced summer items at the market, including two new mustard products and peach ice cream. The campus meat lab is offering five seasonal sausage flavors that include apricot turkey, chicken parmesan, chicken enchilada, cheddar beer braut and pork parmesan pesto and Pino Gris. After several bottling days in recent months, the market has also restocked its reserve of award-winning Fresno State wines. Its white wine selection features a new Albarino wine and past favorites Viognier and Muscat Canelli, while its Syrah Rose and Red Zinfandel wines will also be among many student-made wines that will be entered in international competitions this summer. For more information, contact 559.278.4511 or farmmarket@fresnostate.edu, or visit the Gibson Farm Market’s Facebook page at www.facebook.com/FresnoStateFarmMarket.